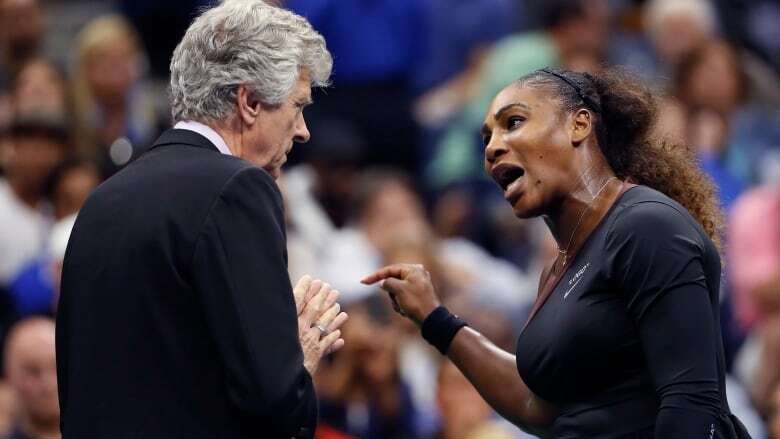 The discussion over a series of calls against tennis star Serena Williams on Saturday during the women's final of the U.S. Open against Naomi Osaka is provoking a heated debate among athletes, fans and celebrities about fair treatment, chauvinism and equal rights. The discussion over a series of calls against tennis star Serena Williams on Saturday during the women's final of the U.S. Open against Naomi Osaka is provoking a heated debate among athletes, fans, commentators and celebrities about gender equality, chauvinism and fair treatment. I can never truly appreciate the real sexism and racism that Serena Williams will have absolutely faced in her life and career. <br><br>But she faced neither in that Grand Slam final. <br><br>Carlos Ramos made absolutely the correct calls as a chair umpire. Williams has been fined $17,000 US for three code violations by official Carlos Ramos during her 6-2, 6-4 loss to Naomi Osaka on Saturday. First, she was accused of getting coaching signals. Then, she broke her racket which cost her a point, and finally, her reference to the umpire as a "thief" cost her a game. Williams's coach, Patrick Mouratoglou, acknowledged afterwards that he did try to signal Williams. Former players said it's common practice and they're rarely called out for it, adding that any questionable behaviour usually gets a "soft warning" first. "He's never taken a game from a man because they said 'thief.' For me, it blows my mind. But I'm going to continue to fight for women," she said. Former tennis star Billie Jean King, whose life story and gender equality activism was recently chronicled in the film Battle of the Sexes, said the situation exemplifies a "double standard." "When a woman is emotional, she's 'hysterical' and she's penalized for it," King wrote on Twitter. "When a man does the same, he's 'outspoken' & and there are no repercussions." (2/2) When a woman is emotional, she’s “hysterical” and she’s penalized for it. When a man does the same, he’s “outspoken” &amp; and there are no repercussions. Thank you, <a href="https://twitter.com/serenawilliams?ref_src=twsrc%5Etfw">@serenawilliams</a>, for calling out this double standard. More voices are needed to do the same. The U.S. Open faced backlash for sexism earlier in the tournament after French player Alizé Cornet took off her shirt, which she realized she was wearing backwards, and put it on correctly while standing near the rear of the court. She was given a code violation by the chair umpire, which officials later said they regretted. 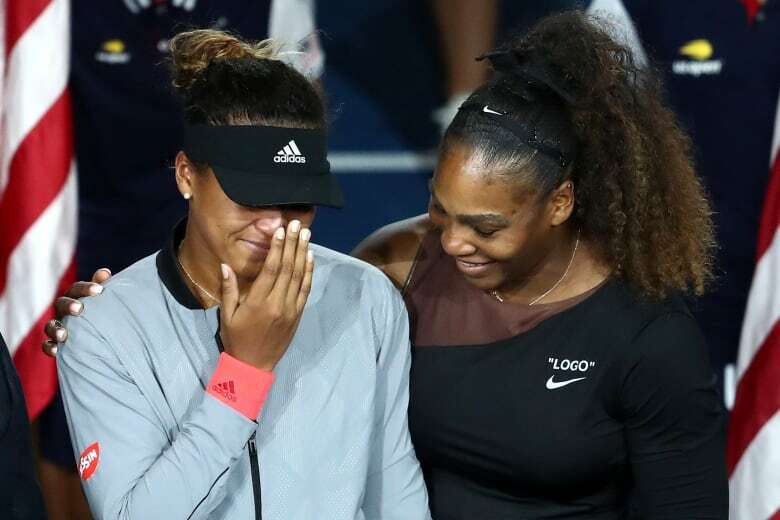 The controversy between Williams and the umpire overshadowed Osaka's victory and marred what should have been a shining moment for the 20-year-old player who counts Williams as an idol. Williams stepped in to stop the crowd's booing during the awards ceremony and was seen consoling Osaka. High-profile figures such as comedian Kevin Hart and Being Mary Jane star Gabrielle Union jumped in to praise Osaka for "demonstrating #BlackGirlMagic and fierce determination." "You played an amazing match," Hart wrote. "Enjoy & embrace your moment."